The alpaca is a domesticated member of the camel family and native to the high Andes Mountains of Peru, Bolivia, Chile, and northwestern Argentina. Alpacas are small animals raised primarily for their fleece. They were domesticated over 5,000 years ago, and it is thought that humans used their fiber for 4,000 years prior to domestication. Alpaca has been considered a luxury fiber for much of this time, for example the Incan Empire reserved alpaca fiber for royalty. Alpacas are close relatives of the llama and vicuña (see sidebar). Llamas were used as beasts of burden, whereas alpacas were primarily used for their soft, luxurious fiber. Alpacas differ from llamas in that they are smaller and lack the coarse and brittle hair of the llama. Alpaca differs from sheep's wool in that it lacks the greasy lanolin coating on its fleece and wool fiber's prominent scales. Without the lanolin, the fiber hangs from the animal in glossy strands and can be processed into yarn without a complicated scouring process. In addition, people with sensitivities to wool generally find that they can wear alpaca without their skin being irritated. Its hypoallergenic nature is due to it being lanolin-free and having very fine scales on the surface of the fiber. The fibers of the alpaca are hollow. This gives alpaca an excellent insulating ability and makes alpaca fiber products feel very light in weight. The wool fiber is sheared from the alpaca in the spring of every year. The fiber ranges in length from eight to twelve inches, and sometimes longer. It is generally processed on the woolen spinning system to produce soft, airy yarns. There are two types of alpacas, the huacaya and the suri. The huacaya alpacas have soft and crimpy (wavy) fiber. 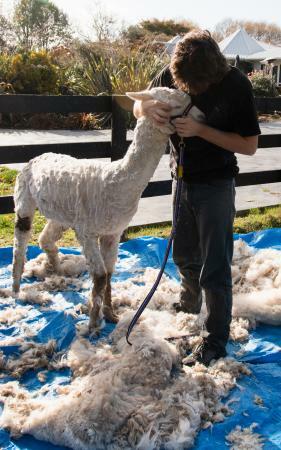 The suri alpacas have long, pencil-like locks of fiber, which are silky and lustrous. They both produce over twenty natural colors of alpaca, including white, light fawn (a light, grayish brown), light to dark brown, gray, black, and piebald (blotched with white and black). Like sheep's wool, alpaca fiber absorbs dyes very well. Alpaca fiber is desirable because it is fine, soft, lustrous, and elastic. In the nineteenth century, Sir Titus Salt made use of alpaca's properties to create luxury fabrics for the English market. Alpaca yarns were inserted into the weft (crosswise direction) of the fabric with yarns of cotton, silk, or wool in the warp (lengthwise direction). In the early 2000s, alpaca fiber is found in knit sweaters, hats, and scarves that are hand- or machine-made. Many handmade products are manufactured in the countries where alpaca first originated. Vicuñas (vy-KOON-yuh) are the smallest member of the South American camel family. They live at an altitude of 12,000 to 16,000 feet near the snowline of the Andes Mountains. Adult vicuñas are 21/2 to 3 feet (69 to 91 centimeters) high and weigh 75 to 140 pounds (34 to 64 kilograms). 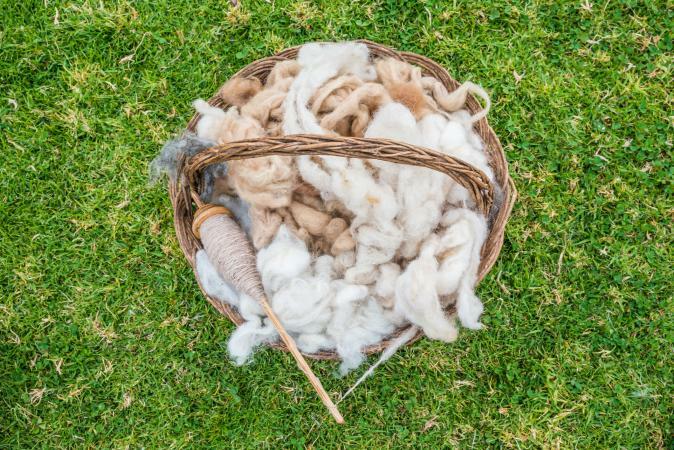 Vicuña fiber's limited supply and luxurious qualities make it one of the most valuable luxury fibers. The vicuñas' wild nature made it easiest to obtain the fiber by killing the animals. In 1970, vicuñas were placed on the Endangered Species List. Over the last thirty years, the Andean countries protection efforts have allowed the vicuña population to increase. Efforts are under way to change its classification from an "endangered" to "threatened" species. Each vicuña provides about 4 ounces (114 grams) of fine fiber and around 8 ounces (284 to 340 grams) of shorter, less choice fiber. Fine vicuña fibers measure 12 microns in diameter, which is finer than cashmere. Its color ranges from red-brown to light tan to yellow-red. The fiber's softness, luster, strength, and warmth without weight result in highly desirable fabrics. Raw vicuña fiber, which includes fine and less-choice fiber, has sold at auction for $200 per pound. In 2004, the only vicuña wool that can be legally traded is that which is sheared from a live vicuña at an officially authorized facility. Since the vicuña is an endangered species, those wishing to import it must carefully examine and follow the regulations governing its trade. Alpacas have a gentle and docile disposition that has made them popular animals for hobby farms in the United States and Canada. In 2001 the Alpaca Breeders and Owners Association reported over 30,000 registered alpacas in North America. The products made from the fiber from these alpacas are being marketed through the Alpaca Fiber Cooperative of North America, Inc.
See also Fibers; Wool; Yarns. "Endangered and Threatened Wildlife and Plants: Proposed Reclassification of Certain Vicuña Populations from Endangered to Threatened and a Proposed Special Rule." Federal Register, Proposed Rules, 64, no. 173 (September 1999): 48743-48757. Alpaca Fiber Cooperative of North America, Inc. "About Alpaca." Available from http://americasalpaca.com. "Species Profile for Vicuña." U.S. Fish and Wildlife Service. Available from http://endangered.fws.gov.